This article adds additional details to the research on the history of the Wildflower Garden done by Martha Hellander in 1989-91 for her book on Eloise Butler - The Wild Gardener. Background: How big was the early garden? A detailed description of the Garden given in The Bellman article of May 1913 states that it was then “three or four times its original size”. Eloise writes “Within a space of twenty acres may be seen in an hour what would be impossible to find in traversing the state for several days.” (EB, Letter to Theodore Wirth, Jan. 1914), and “My twenty acres of garden within a park of about 600 acres, includes one small tamarack bog, but none of the ponds.” (EB, Notable Features of My Wild Garden, March 1915). Eloise describes her placement of the dam. “A tiny stream threaded the bog and emerged into a depressed area of slimy ooze flanked by low banks. A dam was constructed that converted the depression into a lovely pool …..” (1 pg. 155; 2). Below: The pool in the Garden as illustrated in The Bellman article of May 1913. Martha Hellander’s plan map of the old garden. The ‘tarvia path’ runs near Bubbling Spring and and then curves to the west, encircling the outside of the current garden space and reaching the parkway. Secondly, she refers to a pond not too far away [the Lily Pond] and third, she already has the idea for creating a sizable pool in one of her meadows. That implies it is the area currently north of the Garden toward the Wirth Park picnic grounds that had been annexed to the reserve. This, as we shall see, was the site of the Mallard Pool. Eloise then, in 1917, records having this earthen dam replaced by a concrete dam. (Eloise Butler Garden Log (EBL), May 9, 1917). The location of this dam is fairly clear as outlined above. In her annual reports to the board of park commissioners, Martha Crone requested at the end of 1954 and again at the end of 1955 (Feb. 21, 1955 and Feb. 14, 1956 respectively) (3) that the crumbling concrete dam be replaced as it was causing dangerous conditions on the tarvia path just outside the Garden. She does not note when it was replaced, but presumably it was and lasted until 1992 when the current dam was installed. We will see later that by 1955 the Garden boundary configuration was very similar to what it is today except for the realignment of the back fence in 1992, modification of some paths in later years and the addition of an acre to the prairie in 1993. 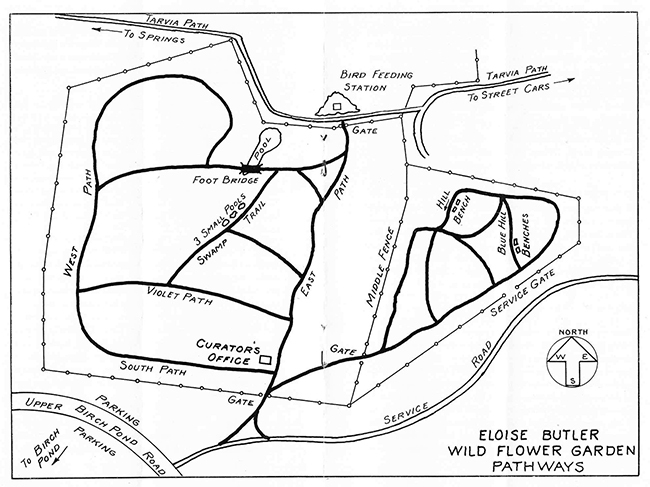 So, in Jepson, no earlier than 1929, we have repeated Eloise's idea of a large aquatic pool to be formed and we also know that the tarvia path bisects part of the garden from east to west. This pathway is a various times called a ‘path’, a ‘road’ and a ‘walk’. We shall determine later the point at which the garden was reduced in size to not include that open meadow mentioned in Jepson. 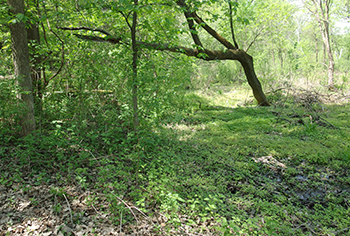 May 15, 1910: Planted from Mahtomedi several yellow water buttercups in brook, below dam. Sept. 11, 1911: Planted from Park Board Nursery 6 hemlocks on both sides of brook, below dam. July 10, 1915: planted …. 7 Polygala sanguinea, border of north meadow. Sept. 23 1916: planted apple moss on moss bank, border of northwest meadow. July 2, 1917: Transferred 3 roots of Lysimachia nummularia to side of outflow from pipe below dam. October 6, 1917 ….2 Ilex verticillata south side of road near east footpath. June 22, 1918 Noted Crataegus macracantha, border of tarvia road. August 4, 1918 Noted Teucrium south of tarvia road. Here we see in 1917 the first mention of a “road” and in 1918 the first use of “tarvia road”. Cary George (5) has said that the path behind the current garden fence followed an old Indian trail through the area. Might 1917, the year of the concrete dam, be the year that the old path was widened to become what Eloise called a “road” and then paved to become a “tarvia road”?? To summarize what was written above: The garden pool is first mentioned in The Bellman article cited above and then by Eloise in her 1915 article (EB, Notable Features of My Wild Garden, March 1915), when she wrote “I have a pool in the garden that was formed by building a dam across a brook and it is proposed to make by excavation a sizable pool in one of my meadows for more aquatic plants;” and again in 1926 when she wrote the history referenced in Hellander (1 pg 155; 2). We have also seen that the open meadow north of the garden pool and north of the tarvia path were part of her domain from the very early years. Forward to 1932: Now we come to how the Mallard Pool was formed and also where. In her letter to The Gray Memorial Botanical Chapter, (Division D ) of the Agassiz Association for publication in the Asa Gray Bulletin, she writes in 1932 (6): “Ever since the Native Plant Preserve was started I have wished to have a pool constructed where two small streams converge in an open meadow, the only pool in the Preserve being too shady for aquatics. The hard times gave this joy to me, for a jobless expert did the work for a sum that could be afforded by the Park Commissioners. The pool is about 35 feet long, several feet narrower, and of irregular outline. Indeed, the contour is beautiful. The excavation was made in a dense growth of cat-tails. While digging, the workman saw a mallard duck wending its way through the meadow with a train of four little ones. Hence the name of the pool, as this duck had never been listed before in the Garden.”(the article - Mallard Pool, October 1932). In that last reference Eloise places the pool “where two small streams converge in an open meadow”. 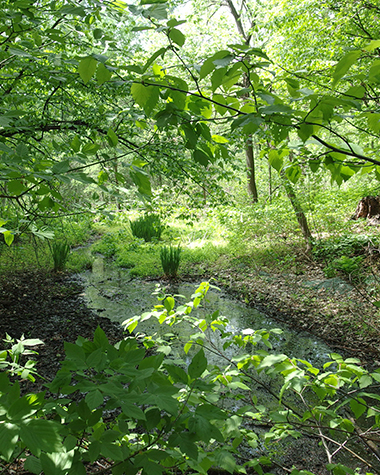 The Jepson article cited above states that it is “proposed to form at some time a pond for aquatics by an excavation in an open meadow where two small streams combine that flow from springs in the garden.” The spot where two streams converge is still seen today just north of where the outflow from the garden dam passes under the old tarvia path. The garden outflow is one of the streams and the other comes from the eastern section of that north meadow and today is fed by groundwater near the surface in Springtime and rain runoff, but in 1932 it was also continuously fed by what was called the “Bubbling Spring” which is located right next to the tarvia path, just east of the current back gate. 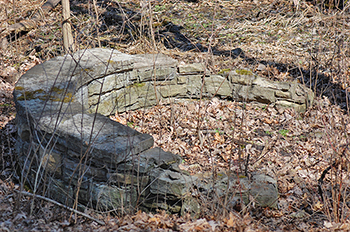 What remains is the stone catchment basin erected by a WPA masonry crew in 1939. The spring was last known to flow in the 1950s (“Springs in and near the Garden”, Garden History Archive). Cary George related that there was a little flow from time to time in the early years of his tenure. 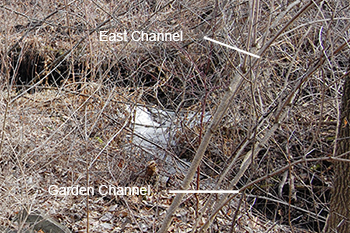 The spot where the water flow from the garden dam (coming from the right) converges with the water channel from the east (entering top of photo) the the joined streams flow northwestward (bottom left in photo). The area to the east of the convergence with a water channel running westward in the center of the photo. The bubbling spring basin is somewhat obscured by vegetation at left center. Looking northwest from the convergence of the two streams, the water flows in the direction of the old lily pond into the area that contained the old Mallard Pool. 1. As the dam formed the small pool in the garden, water had to drain downhill to reach what would be the Mallard Pool. After the pool was constructed Eloise states “Opposite at the upper end (of the pool) is “The Gurgler”, the water entering gently by a short series of low rapids” (EB, Mallard Pool article). [The lower end of the pool is where Eloise had Lloyd Teeuwen (7) construct the rustic bridge that she is pictured on in the 1932 photo below.] Low rapids would have be formed from water flowing out of the dam and down into the north meadow which is of lower elevation. 2. Next, we add another descriptive term: We know that the Mallard Pool was in an area that Eloise Butler called the “north enclosure” as Eloise noted that fact on July 7, 1932 in her log: “Mallard Pool completed in North Enclosure”. So, what was the “north enclosure”? 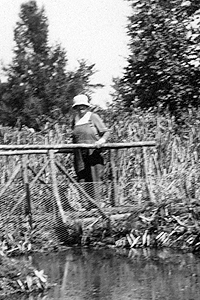 In 1924 when Eloise Butler had a fence installed, it was in two sections. (See Garden Fence, Garden History Archive). The first section, finished on July 16, 1924 (EBL), was to protect what she called “lady slipper meadow” and several days later she reports beginning planting within the “north enclosure” (EBL Aug. 1, 1924) There was thus, a “south enclosure” but she does not specifically name it as such until 1925. [That turns out to be part of where the existing garden is]. 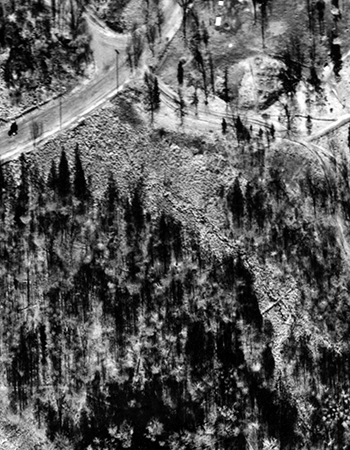 The result of two fences was that there was a fence along both sides of the tarvia path as photos from 1932, '36, and '37 clearly show, as does the Park Board blueprint for the Upland expansion in 1944. (See Garden Fence, Garden History Archive). (That numerous lady slippers were located in that north area, can also be gleaned from The Bellman article. Eloise reports in her log many times of planting in the north meadow and after July 16, 1924, planting in or near the “north enclosure.” In Martha Crone’s time Martha would sometimes refer to this also and sometimes Martha would call it the “lower enclosure”. How long did the Mallard Pool last and why was it abandoned? Detail of Eloise Butler on the rustic bridge of tamarack poles at Mallard Pool in 1932. Note the wire netting used to keep muskrats out. Photo Minnesota Historical Society. We can deduce from Martha Crone’s Garden log that she actively kept up part of that northern meadow at least until 1939. Here are samples - all from her log. 1934, April 9: Woodcock in woods near swamp west of Mallard pool. 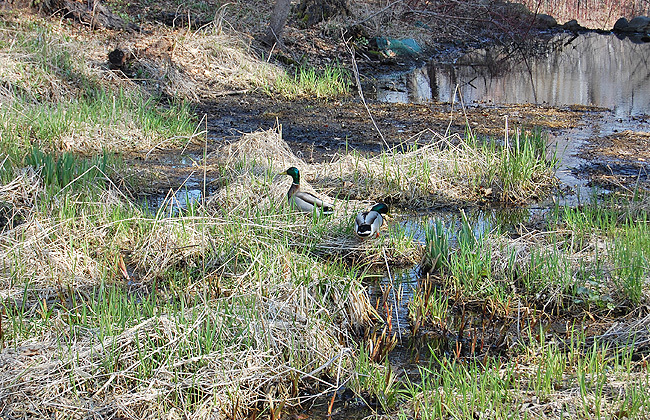 1934, May 25: Found nest of Pheasant on edge of Mallard pool containing 11 eggs. 1934, June 17: Found nest containing young of Green Heron, mother bird flew short distance, in Tamarack on north boundary of lower inclosure. 1934, July 5; planted 18 Christmas fern on east and west border of pool, also at rustic bridge. 1934, July 12: Planted from Stillwater 12 Bladder Fern on east edge of pool and near foot bridge (although this may be at the small original pool). 1935, April 26: Saw woodcock in lower enclosure. 1936, Aug. 29: Transplanted a number of Showy Lady’s Slippers to a new colony in lower enclosure. 1937, July 16: 2 Habenaria fimbriata in bloom in lower enclosure near book and High-bush Cran. 1938, May 14: Also Autumn Willow in beautiful yellow color along broad path west of North enclosure. 1938, May 27: Planted 2 Valerian (Valerian edulis) in north enclosure below waterfall. 1938, Aug. 30: Warbling Vireo still in song noted near north boundary of lower enclosure. 1939, May 19: Planted 10 American Dog Violet from Cedar swamp in lower enclosure below dam. We know that Eloise had part of that northern meadow fenced in 1924 (see notes above). Further fencing, or maybe replacement fencing was done in 1939. In 1938 a Works Progress Administration (WPA) crew erected at least 1,900 linear feet of chain link fence around part of the space that is today’s garden. It included 3 gates. (See Garden Fence, Garden History Archive). On January 18, 1939, Martha Crone reported that the Park Board workers were in putting in a new fence in the "lower enclosure" (Martha Crone's Diaries (MCD), 1939). Whether this replaced the 1924 fence or added additional fencing to enclose more area is unclear, but it would then seem that it was the intent to keep up and protect that area. The fence materialis thought to be the same as that used by the WPA. See upland garden notes further below. Based on what happened several years later, it is an interesting question as to why this fence was put in. We have available aerial photos from the Winter of late 1938 (courtesy University of Minnesota). 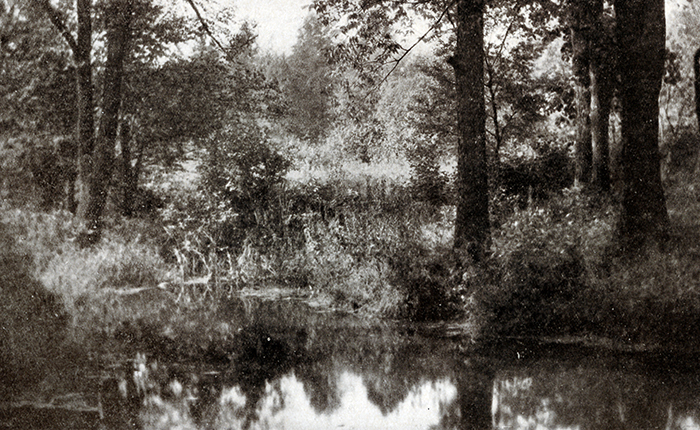 One can see from the 1938 photo that the area where the Mallard Pool was located, and the entire area of the old lily pond has filled in with cattail and other vegetation. 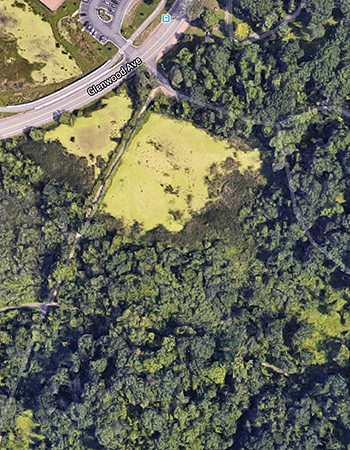 The water channel is still visible and in the lower right section would be the Mallard Pool area, now mostly overgrown. The straight diagonal line in the photo where the Mallard Pool was may be the bridge and the plank walkway that Eloise mentions in her 1932 text where she says “at each end of the bridge, a plank walk was laid over the cat-tail slough”. The second photo (color, courtesy Google) is contemporary showing the changes to that area since them. The old Lily Pond area is now somewhat clear of cattails with open water in the Summer. This area was modified in 1957 when the The Park Board put in a large diameter underground pipeline to divert water from Bassett's Creek to Brownie Lake. That line lies beneath the gravel path that now bisects the area and beyond the pond the pipeline lies under the walking path. 1946, June 11: 32 Showy Lady’s Slipper from lower enclosure to violet path. By these dates most or all of the 1939 fence had been removed. 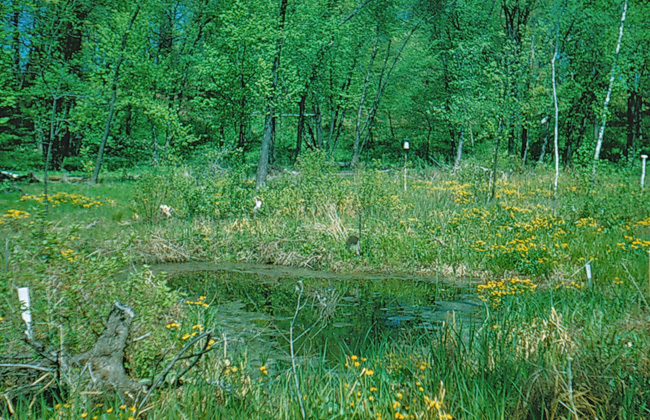 When Clinton Odell proposed to the Park Board in 1944 to add the current upland area to the Eloise Butler Wild Flower Garden, Martha Hellander’s research found that Odell said to the Park Board that the northern area (which included the Mallard Pool) should never have been fenced and that it was swampy and should be abandoned in favor of an upland area which the garden did not have at that time (1 pg. 104). In an exchange of letters in 1944 to Odell from Park Board Secretary Charles Doell and from Superintendent C. A. Bossen, the Park Board agreed with parts of his proposal, including the funding that he proposed. (more details in The Upland Addition to the Eloise Butler Wildflower Garden, Garden History Archive). 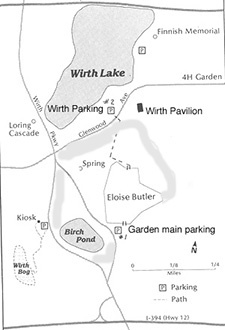 Area of Wirth Park around the Garden. 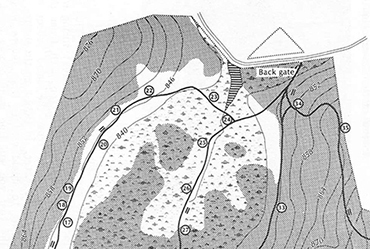 The area within the gray outline was added to Garden control in 1964. Former Gardener Cary George (1987-2003) remembered that the chain link fencing that was used in the northern enclosure was removed and used to fence the new upland addition, because in 1944 wartime shortages of steel precluded new fencing being obtained. Presumably there was a garden record of this, but it may have been related to him by Ken Avery (1954-1986). So here we have this conclusion: The Mallard Pool area was still being somewhat attended to by Martha Crone until about 1940, then abandoned by 1944. The Bubbling Spring dried up more or less permanently by 1959 (“Springs in and near the Garden”, Garden History Archive). The area reverted to the wild area we have today, EXCEPT that in 1964 the Garden was expanded to four times its size by the inclusion of the “wild” area west to the Parkway, north to Glenwood Avenue and east to the picnic grounds (shaded boundary on map at right) (8). This idea was never fully carried out as staffing was insufficient to care for that large area and by 1967 it was back to 13 acres and the Mallard Pool area was once again left to grow wild as Eloise Butler had found it in 1907, except that it became the basis of a buffer zone around the garden in later years. Other pools in the Garden, from 1913 down to today. We have seen from the above that there was very early on a pool in the garden formed by that original earthen dam and based on the descriptions in The Bellman article of May 1913, and Eloise Butler’s 1926 writing (1 pg. 155; 2) it was in the current location, but maybe larger. The Bellman article states that you passed the pool on the way to Puffball Flats and Roaring Camp (see map). So that was the pool of Eloise Butler’s day prior to her creating the Mallard Pool in the northern meadow area. When Martha Crone became curator several other pool events happened. In 1939 she had a spring inside the wetland on the western side of the pool tapped and a pipe installed to provide water to the small pool (following several very dry years) (“Springs in and near the Garden”, Garden History Archive). 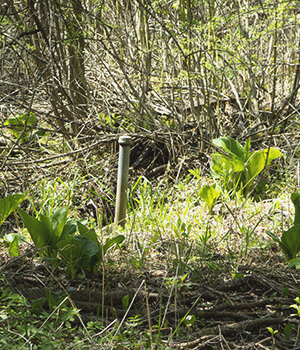 According to Cary George, the pipe she had installed is the one still visible near the large River Birch just south of the boardwalk and west from the boardwalk bridge. In 1946 she had a new corduroy lined path laid through the wetland from North to South. 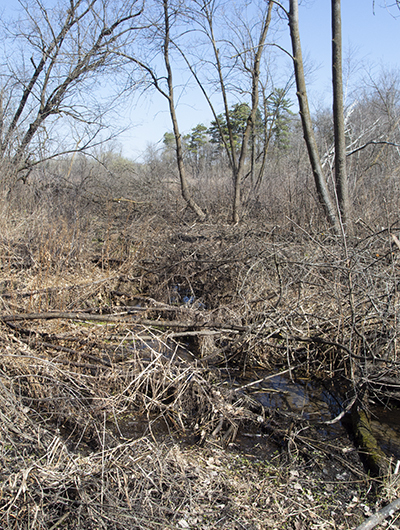 Previously, there were only short stub paths leading into the wetland In 1947 she had three additional pools excavated in a more sunny location for purposes of displaying aquatic plants. These were close to each other and more in the middle of the wetland. 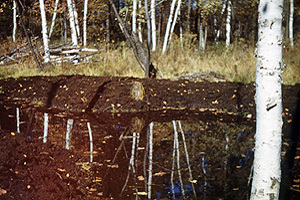 Pool #3 shown on Oct. 19, 1948, just after being enlarged. Ken Avery wrote that he and his helper Ed Brucklemyer dredged them out several times, as they always silted in. They did the first excavation in 1961, removing swamp grass and digging out to a depth of 18 inches. The pools were not connected and if rainfall was not sufficient, the pools would be filled with a hose run from the city water supply in the Upland Garden, one pool at a time. So when Ken and Ed dug out the pools they created a channel from one to the other so that filling one would cause the others to fill also. By 1965 the pools were only 6 inches deep so Ken dug them out again, this time to a depth of two feet. By 1979 the pool channel was silted in and had to be dug out once more. Eventually Ken just let them silt in. They still exist, but probably heavily silted in and with cattails and all, do not maintain visible water. Cary George stated that he would put waders on and periodically clean them and that water lilies still bloomed during part of his tenure. One was still so deep that it came over his waders. Below: This photo from May 6, 1949 shows the same new pool that had been enlarged the year before. In the photo below taken on May 27, 1950, we see what was called "pool #3," two years after enlargement, with vegetation covering all scars. Below: Here is another view of the marsh taken on the same day, May 27, 1950, from a different angle, with the same pool visible. 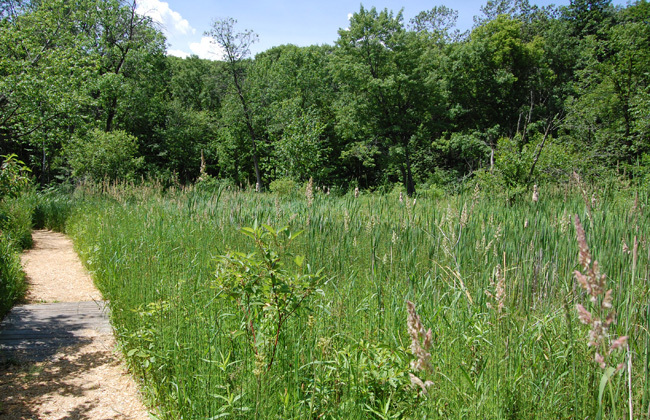 Below, in a photo from June 23, 2008, we see the vegetation of the wetland today. It was such a chore to keep the pools open that after digging them out in 1979 they were left to silt in. Without open water, a number of the water plants that Eloise Butler and Martha Crone had set out can no longer grow. There can be standing water in the wetland in the spring and during very rainy periods, but not open pools. Below, in a photo from April 2008, the topography of the wetland area is clearly visible. The perspective is from the opposite direction from the photo above. The path probably follows the original path established by Martha Crone in 1946. 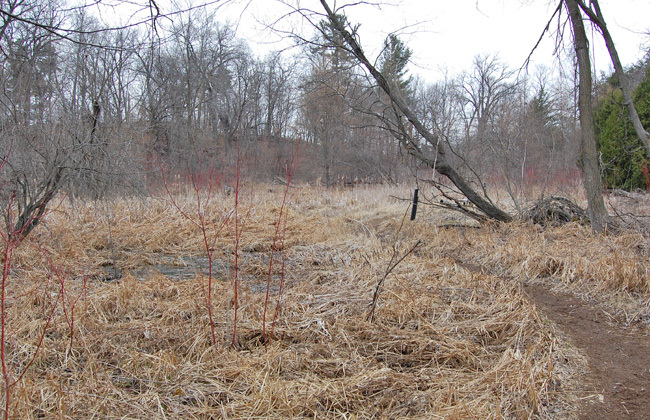 The depressed area behind the Red Osier Dogwood may be the site of one of Martha Crone's pools. Below, the same area as seen above but from a closer position. The black path marker post is a reference point. May 2018. 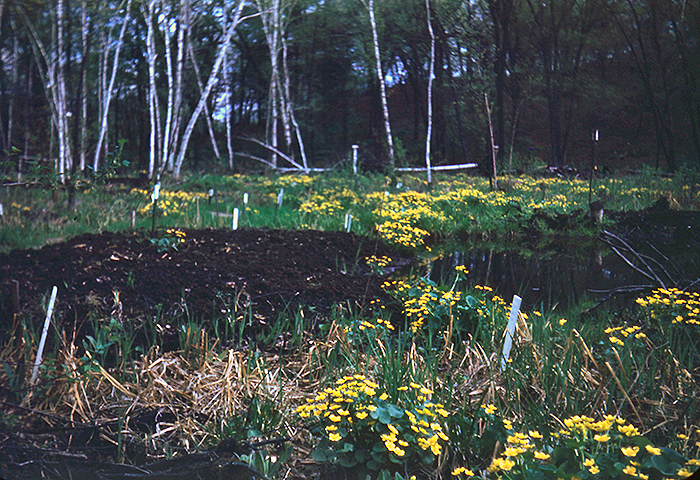 Below: In the spring the lack of open water creates a perfect environment for Marsh Marigold (Caltha palustris) which is prolific in the wetland in early May. Here we see the layout of the Garden and the paths in 1952. It is not to scale, the north-south vertical distance is much fore-shortened to accommodate the brochure paper. The fence outline is much the same as today except for the renovation at the back gate and the 1993 addition to the Upland Garden. The paths are somewhat different. The original pool is shown with a bridge on the footpath. 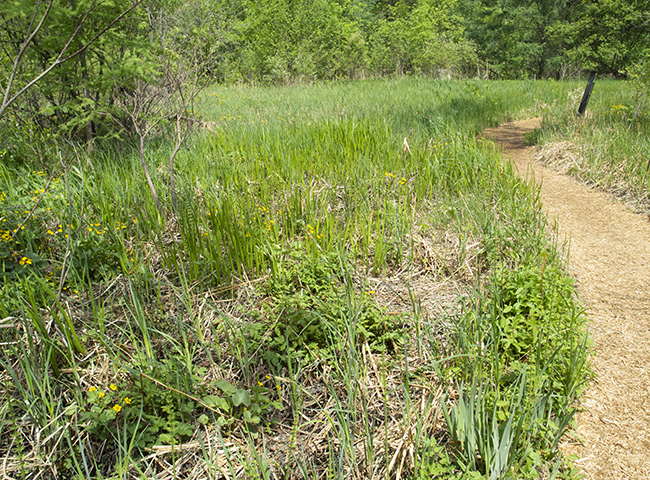 The three new small pools are shown on the “Swamp Trail.” The side paths in the wetland no longer exist, except that the path labeled "Violet Path" retains the eastward portion from the Swamp Trail to the East Path. The loop in upper left is also gone. The East and West path and the path through the wetland are fairly close to today's arrangement. The upper Garden is also different; the two side paths framing "Blue Hill" are not there and the addition of 1993 modified the paths to the east. We also see that Martha depicted a fence line going into the old north meadow, but there is no longer a fence lining both sides of the Tarvia Path. The Bubbling Spring is just off the Tarvia path next to that fence line. The dry summers, particularly 1988, silting up, etc., leads me to conclude that there was not much open water area in the current pool area, (the remnant of the original garden pool) if any, at the time it was re-built in 1991/92, at which time it may have acquired the current name of Mallard Pool. The Garden guidebook issued as late as 1988 does not mention a pool but does include a drawing of the Garden showing a pool in the original position of Eloise’s Butlers garden pool, and also shows the old fence line. Cary George remembers it being called Mallard Pool, but that may have been after the 1991/92 renovation. In 1992 the back section of the Garden was rebuilt and the back fence was realigned, moving the fence and the tarvia path northward. We have four diagrams that show the location of the back fence prior to 1992. They were drawings used in the 1981 Garden Guidebook and the 1987 Garden Guidebook, Martha Crone’s 1952 map for her Self Conducted Tour brochure and the 1944 Park Board blueprint showing the boundary lines of the Garden and the proposed upland addition (see Upland Addition). All show the fence in the same position with only the 1981 map not showing the path. All four drawings would place the old position of the Garden fence very close to the dam for the Garden pool. That the old tarvia path was moved with the fence in 1992 is fairly clear from the difference in age of the sections and that visually, the old path from the NE leading to the gate is abruptly interrupted by the newer section. 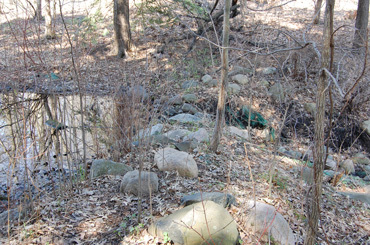 For the 1991/92 renovation of the pool space, Sandra Welsh of the Minneapolis Park and Recreation Board secured an Open Space Habitat Improvement Grant to re-align the walking path, dredge the pond, and create a rock outcropping and waterfall in the water channel. That ‘rock outcropping’ was probably in the same place as the older concrete dam that Martha Crone asked to have repaired in 1955 and that Eloise Butler had built in 1917, but no one remembers that time period. The existing rock outcropping dam installed in 1991/92. 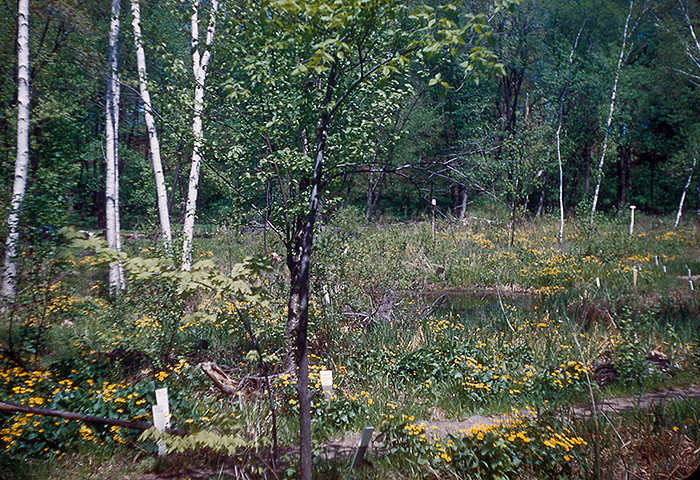 1934, July 31: Planted from near Duluth …24 twin flower near feeding st,, near foot bridge and in swamp. 36 Creeping Snowberry near feeding st., foot bridge and swamp. 1934, Aug. 23: planted from Isle Royal .. . 12 American Rock-brake near the tin bridge. 1935, June 6: Planted from Stillwater 25 walking ferns near bridge in south enclosure. Only the last entry and the 1952 map are definitive of being in the current garden area and thus near the current pool. It is not until we get to the placement of a new cedar bridge in 1990 that we learn of it replacing an old wood dock that had been there to cross the water channel. How old the dock was is unknown, but it may have been Martha Crone’s bridge. (History year 1991, Garden History Archive.) That the cedar bridge was replaced by the current boardwalk in 2015. Below: In the first section above is shown a 1913 photo of the old pool by the outlet dam, and here is a photo from recent times of the remnant of that pool. This pool area in the Garden may be entitled to take on the old "Mallard Pool" name as these Mallards find it of interest. They were found scouting out the pool area on April 29, 2008. The current rock outcrop dam is visible at the top of the photo and is in about the same position as all the previous dams going back all the way to Eloise Butler's earthen dam. The pool was dredged in 1992 but has silted in once more. In the next photo we see the same area in May 2018, but further back, by the dam area, looking toward the position of the bridge. Below: A view of the new boardwalk bridge that replaced the old cedar bridge in 2015 - as seen on May 18, 2018 with the pool area mostly filled in with vegetation. All the garden curators referred to in this article from Eloise Butler through Cary George wanted some open water, not just to display plants, but also, as Cary George said, people like to see water, and especially moving water. And if you have water, then aquatic plants come into the picture. One can only marvel at the work that was done completing these various pools and laugh at the way Ken Avery explains how he made a floating bog of Sphagnum Moss to place in one of the garden pools so he could display aquatic plants (Ken Avery History, Garden History Archive). Maybe some day, the original garden pool can be resurrected. It would be less of a project than re-establishing the Mallard Pool. 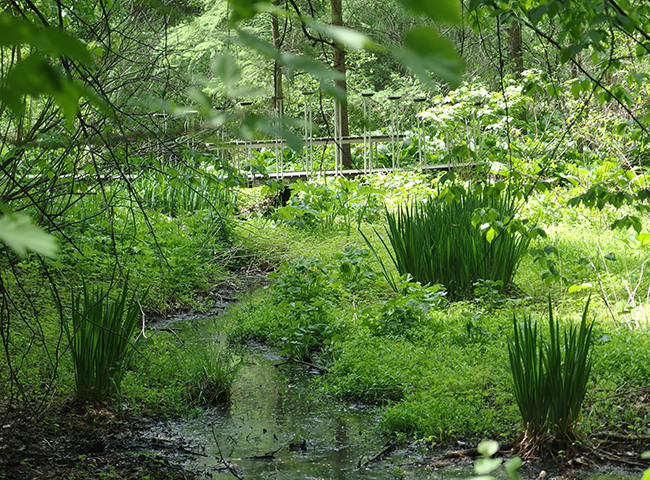 For more information on the wetland at Eloise Butler Wildflower Garden see our article on "Wetland History"
More detail on the Mallard Pool may be found in this PDF. Historical photos are from Kodachromes taken by Martha Crone on the dates indicated above and are from her collection of Kodachromes that was given to the Friends by her daughter Janet following Martha's death in 1989. Contemporary photos of the Garden ©G D Bebeau unless otherwise credited. 1. Martha Hellander’s book The Wild Gardener - noted with page #.. Martha Hellander’s research was financed by the Friends and by the Minnesota Historical Society. 2. 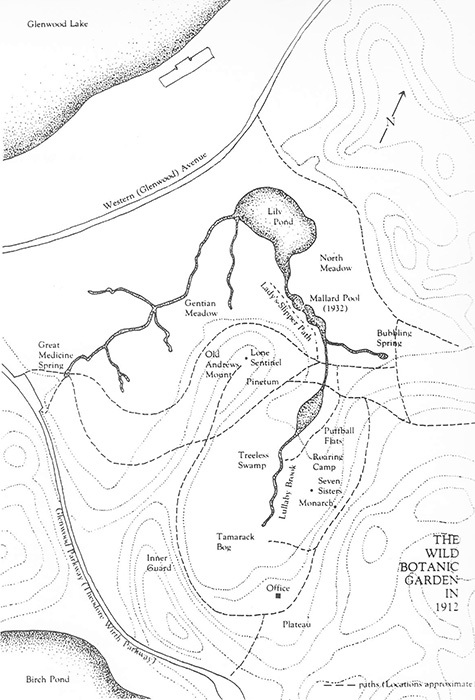 "The Wild Botanic Garden - Early History" 1926, Eloise Butler. This is the text that Hellander references. 3. Annual Reports to the Board of Park Commissioners, by Martha Crone. 4. Jepson, Mrs. John H. Our Native Plant Reserve, Glenwood Park, Minneapolis Minn., Now called “Eloise Butler Wild Flower Garden”. This article was written sometime after 1929 but prior to Eloise Butler’s death in 1933 and placed in the Park Board Archives. Mrs. Jepson’s husband was a parks commissioner at this time. The text was then published in June 1933 in The Minnesota Clubwoman, following the last rites ceremony for Eloise in May and including details of that ceremony. That the article was written no earlier than 1929 is indicated by the subtitle, which name was given in 1929. 5. Cary George, former Gardener 1987-2003, conversation with author, May 18, 2018. 6. Agassiz Association : The Agassiz Association was founded in the late 1800‘s to be an association of local chapters that would combine the like interests of individuals and organizations in the study of Nature. The Gray Memorial Botanical Chapter, (Division D ) of the Agassiz Association was the chapter that included Minnesota and published the Asa Gray Bulletin. Eloise Butler made a number of contributions to it about her garden and about wild flowers. She was a member from 1908 until her death. 7. Lloyd Teeuwen was her helper in the Garden and was with her at the Babcock house just before she went to the Garden on April 10, 1933 and suffered a heart attach. Lloyd returned to the Babcock house as the doctor was administrating to Eloise and was present when she died. Reference in "1" above. 8. Annual Report of the Garden Curator to the Board of Park Commissioners dated March 12, 1965. 9. Ken Avery, Gardener 1959 through 1986. Many of his writings about the Garden were published in The Fringed Gentian - (All issues are found in Newsletter Archive link on Home Page). A printable pdf file of this article can be downloaded at this link. ©2019 Friends of the Wild Flower Garden, Inc. 040219. Text and research by G D Bebeau.